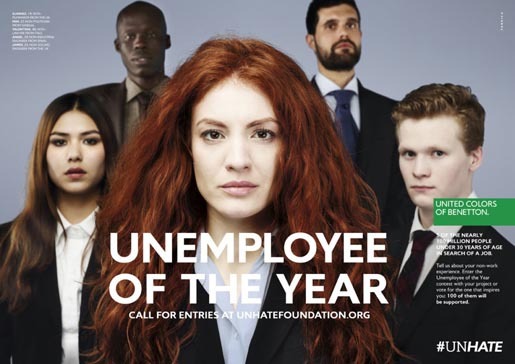 United Colors of Benetton has launched “Unemployee of the Year”, a a contest created for young people all over the world, aiming to award 100 projects proposed and voted by the online community. The project, promoted by the UNHATE Foundation, aims to spread a positive message of hope and celebrate young people’s ingenuity, creativity, and their ability to create new smart ways of addressing the problem of unemployment. Young people between the ages of 18 and 30 years old, who don’t yet have a job, are able to enter their project at unhate.benetton.com/unemployee-of-the-year, in areas ranging from art to communication, from socially to environmentally conscious. Projects could consider the creation of employment opportunities for others and the creation of aggregation spaces in the world, both online and offline. The projects will be voted and selected by the UNHATE Foundation community from September 18, 2012 to October 14, 2012. 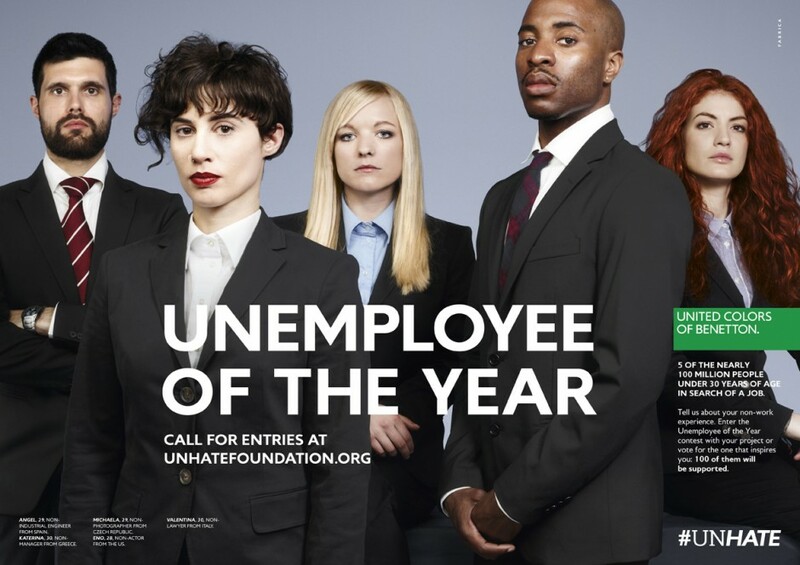 The 100 projects with the most votes will each receive € 5000 funding from the UNHATE Foundation. The official list of winners will be published no later than October 31, 2012. 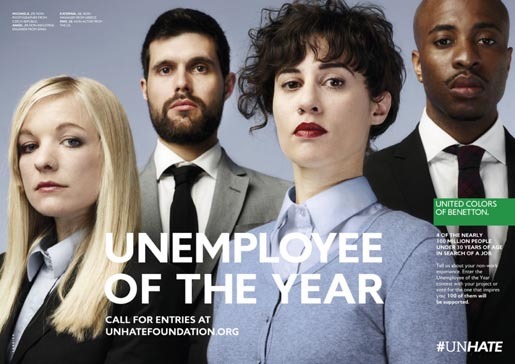 The Unemployee of the Year campaign was developed at 72andSunny Amsterdam and Fabrica, Milan, by creative director Erik Ravelo, executive creative director/copywriter Carlo Cavallone, executive creative director/designer Bryan Rowles, creative director/designer Paulo Martins, designer Patric Franz, brand director Judson Whigham, brand manager Frederic Point, print producer Maria Perez, studio designer Wendy Richardson, executive producer Enrico Bossan, producer Daria Bonera, production director Maria Perez, print adaptations producer Michele Lunardi, head of digital production Gabriele Lunati, digital brand manager Vanessa Roccatelli, digital creative manager Michela Venturin and digital executive Anna Mazzer. Photography by Anna Skladmann was retouched at Loupe Digital Imaging by retouchers Guillaume Koenig and Mark Baxter. Filming was shot by director Tristan Patterson via Smuggler, London, with producer Neil Henry, executive producer Chris Barrett, line producer Gustav Geldenhuys, director of photography Erik Wilson. Post Production was done at Glassworks by producer Jane Bakx, colorist Scott Harris and Flame artist Kyle Obley. Editor was Will Judge at The Gentlemen’s Club. Sound was produced at Kaiser Sound Studios by producer Nathalie Tappin and engineer Ruben de Winter. Music was by Blackwater, via record company Sugaroo.